Born in 1984, Zheng is from the city of Luizhou, Guangdong province. Luizhou city is situated on the Luizhou peninsula with Hainan Island (now known as Hainan province) on the south. Zheng was graduated from the Guangzhou Art Academy in 2007with a Bachelor Degree in Art. He is currently residing in Xiao Zhou Cun, one of the popular art districts in Guangzhou. 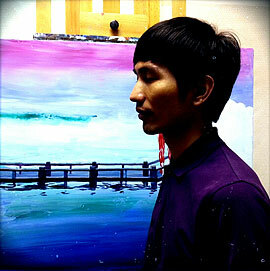 Zheng is a professional artist and specialized in oil painting. “Zheng has a lot to tell in his paintings, his dreams, ego, anxiety, anger and joy. He paints to express his and many people’s feeling about what exactly is the real meaning of being alive,” said art critics.